Project Plowshare: The 1950s plan to use nukes to make roads and redirect rivers. The insane 1950s plan to use H-bombs to make roads and redirect rivers. 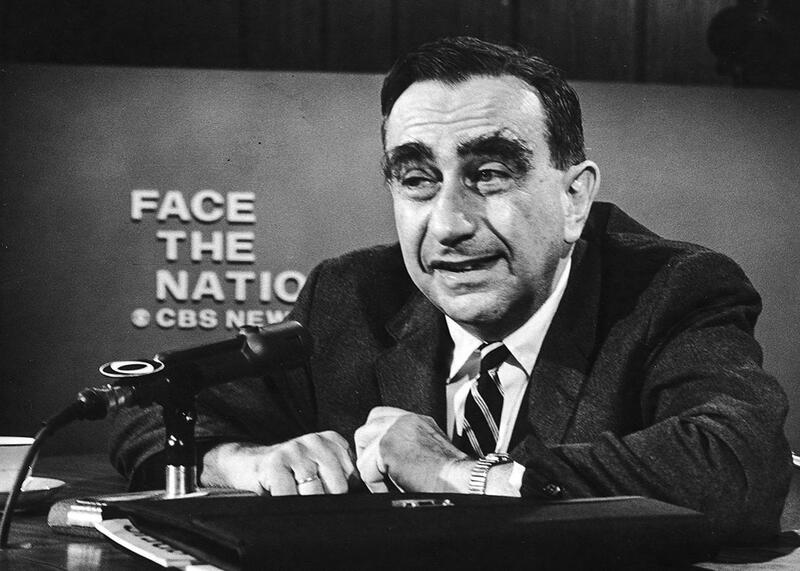 Physicist Edward Teller—part of the Project Plowshare team—appearing on Face the Nation, April 3, 1967. This essay is adapted from Monsters: The Hindenburg Disaster and the Birth of Pathological Technology, by Ed Regis, published by Basic Books. A pathological technology is a triumph of emotional infatuation over reason, logic, and the unpleasant facts of the real world. Such technologies usually center around objects or processes that are physically huge: the airship Hindenburg; an H-bomb blast; a particle accelerator that’s 54 miles in circumference; a starship that would hold thousands of people. All of these things came with grandiose ambitions driven by emotional, romantic, starry-eyed mindsets or utopian spells: Zeppelins were revered by the Germans because of their otherworldly, cosmic, and sublime dimensions; particle accelerators are intended to reveal the innermost secrets of nature, giving us access to knowledge so arcane as to border on the religious. And as for starships, well, what could be more romantic than traveling to the stars? A further characteristic of pathological technologies is that their proponents routinely underestimate their costs, risks, downsides, and dangers. The Hindenburg was an immense vessel, longer than the U.S. Capitol building, but it was filled with more than 7 million cubic feet of inflammable and explosive hydrogen gas, a fact hardly emphasized in its advertising brochures. Traveling to the stars may sound glamorous, until you realize that if the starship’s velocity were as great as that of the Voyager I spacecraft, which is now receding from us at 38,000 miles per hour, it would take 73,000 years to reach the nearest star, Proxima Centauri. Still, in the annals of pathological technology, no scheme was more obviously harebrained than that embodied in Project Plowshare. The idea was to do large-scale excavation projects—digging out new harbors, canals, rivers, road cuts—by detonating a series of hydrogen bombs. The explosion of a hydrogen bomb was one of the most awesome spectacles ever produced, and it held considerable appeal in the minds of those proposing to use that colossal force to perform planetary geoengineering feats. But the radiation unleashed by the bombs was for the most part passed over in silence by the project’s leaders. That idea, however, is not a mere relic of the 20th century: Elon Musk, of the rocket firm SpaceX, has recently proposed nuking the Martian polar ice caps to warm up the Red Planet—a Project Plowshare for the new millennium. That concept, admittedly, embodies a certain amount of intuitive appeal. A bomb, after all, is essentially concentrated energy, and energy is what you need to effect any large-scale physical alteration or displacement of matter. In addition, bombs are quite handy when used for such purposes: They’re relatively compact, light, portable, and fast-acting. They are high explosives writ large. Although special problems arise when the bomb in question emits hazardous amounts of radiation and radioactive debris—otherwise known as fallout—worries about fallout never stopped the world’s would-be nuclear earth movers from proposing a succession of mildly deranged building projects, such as blasting a new canal across Central America (the “Pan-Atomic Canal”), excavating a superhighway route across the Andes Mountains and the Amazon Basin, or diverting the course of the Tennessee River so as to connect it up with another one nearby, the Tombigbee, to create a new commercial shipping lane (the so-called “Tenn-Tom Waterway”). All of these projects, and many more besides, were mere grist for the planetary nuclear engineering mill. If the radioactivity is overlooked. Yes, that was the key to progress in nuclear geoengineering technology, all right: sweeping under the rug any and all unpleasant consequences. And so America’s cadre of atomic earth movers tended, by and large, either to overlook radiation or at all events to downplay it, minimize it, underestimate it, deflect attention away from it, or otherwise treat it as a nonissue. In July 1956, six years after the Reines analysis appeared, Egypt’s Gamal Abdel Nasser nationalized the Suez Canal, which was later closed to traffic for several months. At what was to become the Lawrence Livermore National Laboratory (but which was then known as the University of California Radiation Laboratory at Livermore), a physicist by the name of Gerald Johnson toyed with the idea of excavating a new, alternate canal by means of hydrogen bombs, which had recently been demonstrated in the Pacific. That was just an idea, a thought experiment, not a formal plan of action by any means, but it nevertheless marked the beginning of a trend among a small group of scientists who harbored outsized nuclear geoengineering ambitions. And why not? In addition to the Suez Canal blockage, traffic was increasing in the Panama Canal, which, sooner or later, would itself be ripe for replacement or for supplementation by a new, competing ocean-to-ocean waterway. And so it was no surprise that in February 1957, when the Livermore lab hosted a three-day symposium on the subject of nuclear engineering projects, one of the items under discussion was a scheme for blasting a new sea-level canal across Central America. The Sandia Corporation’s physicist Luke J. Vortman, in a paper titled “Estimated Nuclear Explosive Requirements for Canal Excavation,” calculated that 26 bombs with a total yield of 16.7 megatons would suffice to create this new pan-American seaway. Later estimates suggested that as many as 262 to 764 nuclear bombs might in fact be needed for the task, depending on the location of the canal across the isthmus, its length, width, and depth, and the yield of the nuclear devices used. This range of estimates represented a considerable window of uncertainty. Nevertheless, in all of these scenarios the radiation hazard, whatever its magnitude, was supposed to be dealt with by the temporary displacement of local residents. Apparently this was an idea with legs, because in June 1957, four months after the symposium, the Atomic Energy Commission established a program for the purpose of systematically exploring the theory and practice of nuclear earth-moving. These authorities christened the program “Project Plowshare.” To describe their bombs, the Plowshare scientists tended to use the catchall phrase “nuclear devices,” which covered equally both hydrogen (fusion) and atomic (fission) bombs. However, as Freeman Dyson has explained, “to minimize the contamination of the landscape by radioactive fallout, the Plowshare experts designed bombs whose explosive yield came mostly from fusion and as little as possible from fission.” Thus the strong preference among them for using hydrogen bombs for their nuclear excavation projects. That was the idea. The research for Project Plowshare would take place at the Livermore lab, and the principal investigators would be Gerald Johnson, Edward Teller, Ernest Lawrence, and Harold Brown (who was later to be defense secretary under President Jimmy Carter). Collectively, these men wanted to take atomic or hydrogen bombs, objects almost universally reviled, by scientists and laypeople alike, and turn them into something that was recognizably good. To demonstrate the practicality of their scheme, the Plowshare scientists needed to undertake one or more acts of benevolent nuclear construction. One of the simplest proofs of concept, they decided, was to blast out a harbor at some remote and uninhabited corner of the Earth. That could be done with a mere handful of bombs—five or six—set in a row; exploding them simultaneously would leave a deep trench in the earth that would automatically backfill with seawater. Easy enough. But where to perform this amazing feat? After considering locations as diverse as Arica in Chile, Canada’s northern provinces, and Christmas Island in the Pacific, among other places, the Plowshare team settled on a stretch of apparently barren and deserted shoreline along the northwest coast of Alaska (which at that time was not yet a state). Then they hired the E. J. Longyear Company, a mineral exploration and mining firm in Minneapolis, to narrow down the list of possibilities to one. Longyear settled on a rather craggy and forbidding landmass known as Cape Thompson. Among its virtues, the company said, was the fact that the land was already owned by the federal government; in addition, the site had commercial development potential since it was within striking distance of vast coal and oil reserves. But there were some fuzzy edges to this otherwise bright and rosy picture. In the first place, the area in question was less than 40 miles from two inhabited Eskimo villages, one at Point Hope, the other at Kivalina. In the second place, the site was within 200 miles of the Soviet Union, practically on the doorstep of the nation’s Cold War enemy. And as for those allegedly bottomless oil and coal deposits, they were in actuality a considerable distance away from the blast site, and no form of transportation between these mother lodes and the seashore, other than dogsleds and teams of huskies, yet existed. Moreover, even if a railway was built to take advantage of this gold mine of opportunities, the coastline in question was ice-blocked for nine months out of the year. Despite these drawbacks, which were not minor, Cape Thompson would become the setting for what came to be known as Project Chariot. In the March 1960 issue of Popular Mechanics, Edward Teller (popularly known as “the Father of the H-Bomb”) published an article titled “We’re Going to Work Miracles.” In it he explained for the masses the general rationale behind Project Chariot. Teller cited the veins of coal “and, somewhat farther, oil that might attract commerce except for one vital lack: There is no good harbor, no good anchorage for seagoing vessels.” The obvious solution, he said, was simply to create one, an artificial harbor. Definitely, this was a new frontier in speed-geoengineering. Some radiation would be released in the process of creating the “instant harbor,” Teller conceded, but most of it would remain in the ground as a result of the bombs having been buried deep below the surface. “We expect that all except 10 or 20 percent of the radioactive byproduct will be trapped at the deep zero points and we hope that it will remain practically immobilized in the fused rock.” Well, one can always hope. This particular miracle would be performed, Teller said, “at the mouth of Ogotoruk Creek.” All he had to do was to convince the Eskimos in the vicinity to allow the atomic explosions to take place, since they in fact held proprietary rights to and control over use of the land, even though it was under the formal jurisdiction of the Bureau of Land Management. As the Plowshare scientists made a concerted effort at getting their Alaskan harbor H-bombed into existence, they also proposed a variety of other nuclear earth-moving projects elsewhere. They pursued feasibility studies for carving an interstate highway and railroad line across the Bristol Mountains in Southern California; for blasting out water reservoirs in Australia, Bolivia, and South Korea; and for excavating a harbor on Molokai island, Hawaii. Excerpted from Monsters: The Hindenburg Disaster and the Birth of Pathological Technology by Ed Regis. Available from Basic Books, a member of the Perseus Books Group. Copyright © 2015.